I love everything about my new sectional!!! The color, the size, the comfort. It’s perfect! I rarely get something right on the first selection try. Now we have to work on a 2 person high top kitchen table, a coffee table, a desk, and maybe a new bed. Thanks for all of your help thus far. I’ll be back in for more things very soon! The sectional is amazing. Thank you so much for all the help and the delivery guys for doing such a great job with all the furniture they delivered. The chair is perfect! Thank you for all of your help! We just wanted to follow up and tell you that we LOVE the sectional and chair. Thank you for your help and your patience with us while we were there! Ladies, the mirror is GORGEOUS!!!! Forgive me for not calling sooner! It came on Wed.! I’m in Houston now but got to hold it up before I left; I’ll take a photo of it on Sun. when I return. THANK YOU all SO much!!! I received the chairs yesterday. I love them. Thank you again for all of your help. I really appreciated your diligence and advice. It’s always fun coming in there to see what things I might need! Joni and Greg, Thanks for all you do. Our homes have been enhanced by your design logic and inspiration. All is great! Thank you so much for locating these bar stools! You definitely were determined and went all out for me! We just LOVE our table and chairs. Thanks for checking in with us. We have had several dinner parties since our purchase and now we sit at our new table in the "kitchen" instead of the dining room...ha! It looks just perfect in our space. So glad we dropped in that day and decided to pull the trigger. It only took me three years to get my husband to agree to a new purchase. Maybe it took that long because "we were meant to find Collectic Home". We will definitely visit your store again. Hi, just wanted to leave a comment to say thanks. We had an issue with our custom couch, which turned out to be a manufacturing flaw. I sent an email about it on Saturday, Jerry was out here on Monday, and fixed the problem. (He even accurately diagnosed the problem we were having with our a/c, which we were waiting on a technician to look at.) I'm very happy, all around, with our decision to buy our couch from Collectic Home -- and especially for Jerry. Thank you. The furniture arrived this morning and looks wonderful! It is perfect! Thanks again for all of your help selecting the pieces and fabrics! LOVE LOVE LOVE the couch. Can't wait to add more to the room. Hope to connect soon to discuss rugs and such! I wanted to let you know how pleased we are with the new sleeper sofa. It really looks nice and cozy in the room and we are so happy to have it in place. We truly appreciate your working with us to get this right and will not hesitate to spread the good word about doing business with Collectic Home. The bed looks great and we absolutely love it. You and your staff are A+! We will definitely continue to do business with you guys. You guys ROCK! We love the tall red vase/pot. I can't stop looking at it. We LOVE our new counter stools! They are perfect for our kitchen! I love my couch - it has dramatically changed the look of my living room for the better! The delivery guys were great! I love the sectional!!! I will most definitely refer you to my friends and neighbors. I have a feeling that when my friends see the couch…they will ask where I found it. We will definitely keep shopping at Collectic…my experience as been wonderful! I wanted to let you know that the furniture is FANTASTIC! It all looks great in the space and is very comfortable! The chairs are modern and comfortable, AND they came with four extra cushion covers that match the chair fabric. I LOVE my furniture! You were so great to work with and I am so happy with how the Family Room turned out! Really, I get so many compliments and my entire family can now sit and enjoy a movie together. Thanks for all you did for us! We love the purchases we have made with you. Even the largest side table has worked out beautifully. I know we will be back! Thanks so much for getting the cubes so quickly. They look beautiful in place! We will definitely keep you and Collectic Home in mind for future projects. The chairs are absolutely perfect! Exactly what the room needed. Thank you! We will start looking for a sofa/sectional in the near future, hopefully before the holidays. Will definitely stop by! We really like the Owen queen sofa bed. The fawn color is very nice in a small room and,of course, the mattress is fabulous. The delivery guys were very nice and professional. Thank you for your time and patience in assisting us make the right selection. The bed is very nice. It seems like it would be perfect. Now comes the part where you find out how cheap I am. I imagine that the full bed with frame and custom upholstery would be expensive. What is the cost? Is it possible to just have the headboard and not the frame? Again, your advice was very, very good. I told my husband that your comments were all about balance, scale, proportion etc and he recognized that you did a great job in making the recommendations. We’re going to start putting them in place. I’ll drop by the store to see what you have. I’d love a recommendation for the entry consoles since I doubt I’ll be able to find those sizes otherwise. The tables are a big hit! Our house is currently on the market (I truly bought them for the new house) but I have more people comment on the tables than you would believe. I even had a couple ask if I would sell my furniture with the house! Our Mercedes-Benz van delivers your purchase in style. Unlike many local furniture stores, we do not use outside contractors for the critical logistical aspects of our business: receiving and inspecting merchandise in our warehouse, and delivering and placing them in your home or office. We realize that LAST impressions are often as important as first impressions; our delivery and service staff's prime directive is to make you happy. The delivery was super smooth. Everything fit in the elevator perfectly. The guys were awesome and professional. Steve and Calvin did a great job delivering our furniture and were very careful to make sure everything stayed dry when it suddenly rained. 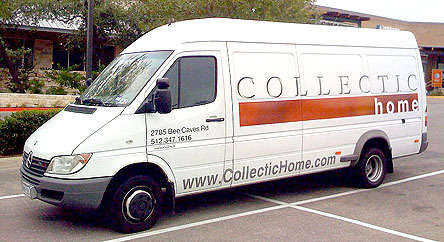 We look forward to shopping at Collectic again when the need arises. One of your drivers helped me out a couple of weeks ago. I had just put gas in my car and forgot to put the cap on. I was stopped at a light at 360 and your driver jumped out of his van to close my gas cap. Calvin and Steven are First Class young men - professional, careful, and friendly. You have the knack for choosing people. Thank you for calling to check on the sofa. It was just what we were expecting and the delivery people were very nice and did a wonderful job! Everything went well with the delivery (the guys were very careful) and we really like our new dining table – it looks great! Jerry came by this afternoon to look at our sofa. He showed me some tricks of the trade and explained how to best care for the sofa. He fluffed the cushions to their original shape. The sofa looks fabulous. We will continue to follow Jerry's protocol and hope to have many years of happiness and comfort with our sofa. 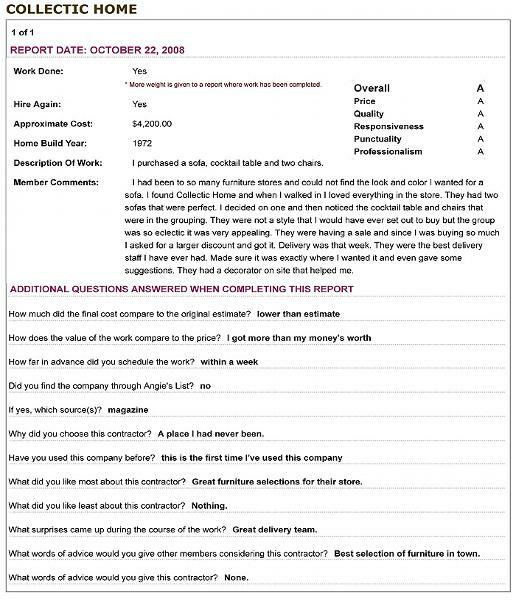 Thank you for your quick response, your understanding, and your fabulous store. As always, consumer service at Collectic Home is exceptional. Hi. I just wanted to drop you a quick note about your delivery men. They have recently delivered two leather chairs and a sofa. Those guys are fantastic. They helped me decorate my room giving me furniture placement advice. They were so friendly and nice. It made the experience a great one. One of my leather chairs came without legs and they were so quick and had it totally fixed by the next day. They are a great part of your store.